Parking is an important node for multimodal transport and is associated with sustainability. Indian cities are experiencing high urbanization, motorization, and congestion and are being ranked in the top congested cities globally. The modal share of India is, public transport ~50%, Private vehicles 20% and walking and cycling totalling 30%. With the burgeoning growth of population noticed, the multiple mode of transport is not fully effectively managed and hence adds to congestion, ride unavailability and expensive illegal fares. Driving alone in India is a common sight with average occupancy rate of 1.13 per car. In a survey it is found that 16% of all commuters drive to work on their own and on average, 67% of respondents drive to work using their car. The reason behind this is awareness and that people are not realizing the idea to share the ride with a stranger. Buses are over occupied and so are trains. But there is a way to solve the challenges. Multi-modal transport system is very effective in a city’s mobility. For a 20km ride, travellers can opt for different mode of shared transport from parking zones and make effective use of public transport and private carpooling services. With an effective carpooling option, daily commuters can save up to 28% of their costs and 14 minutes of precious time, similarly commuting via a bus would help remove ~30 cars (single occupancy) from the road and bring down the cost of ride by a whopping 38% and saves 24 minutes of journey time. Trams/Metros even bring down the cost by 24%, but save almost an hour from the journey. PParke’s smart parking solution is to make the parking experience as pleasant as possible. In order to adapt the service & mobility, it is essential to know the different user groups that park their vehicle, be it commuters, employees, residents or tourists. 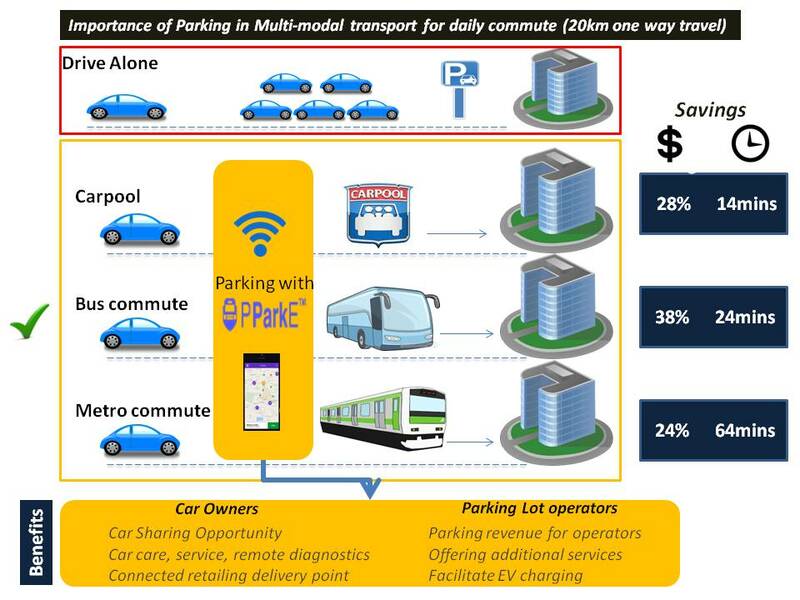 It is very likely that the car park of tomorrow will be a hub for a variety of mobility services that are accessible with App: be it local Events or Sale, Ride sharing, car parking, connected retailing delivery point, Car care, service, remote diagnostics, taxi rentals or charging of electric vehicles. The solution drives revenue for private parking lot owners and creates an opportunity for car owners to have their parked vehicle used for car sharing, convenience services etc.